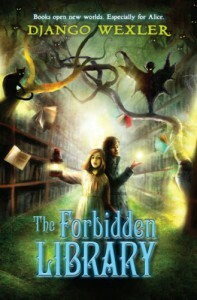 The Forbidden Library is a middle grade fantasy novel about the magic of books; books that are magic and books that are not, and books with fragments of magic within. Alice is a Reader, which means that she has powers related to books. Prison books, portal books, books that lead to the bottom of the ocean and a hundred other things. Experienced, trained Readers use prison-books to cage up monsters; and if you’re a Reader, you can Read yourself into the book to face it. If you defeat the monster, it bends itself to your will. If it defeats you, you die. For real, apparently. Reading yourself into a book is wonderful, fascinating magic. The print moved, with a crawling sensation that seemed to go straight from the page to the back of her eyeballs, and formed itself into familiar English words. Alice opened her eyes in another place entirely. It was dark after the brightness of Isaac’s fire. Her words then become reality, and Alice finds herself inside the book. Most Readers start their training young. Ashes turned out to be a watch-cat of sorts for the Library, the very place that Alice wanted above all things to enter. Alice felt like giving him a kick. For which I do not blame her in the slightest. “They exist,” Ashes said. “You’ll drive yourself mad thinking like that. People have, believe me. It’s like wondering whether the inside of your closet still exists when you shut the door. Keep on down that path and you end up thinking the whole universe is a dream of someone in someone else’s dream, or some such nonsense. So there you have it. A word of warning for those who do not like to read incomplete book series: This book is not a standalone. It is the first book of a series that begins with a quest for a very special book reputably hidden in the Library, with a monster inside that is very nasty indeed; and it ends with questions from the beginning remaining unanswered, and new questions besides. Enjoy.